LEXINGTON, Va. — A rural Virginia city where Robert E. Lee and Thomas "Stonewall" Jackson are buried on Thursday limited the flying of the Confederate flag on poles on several downtown streets. After more than 2 hours of heated debate, the Lexington City Council voted 4-1 to allow only the Virginia, U.S. and city flags to be displayed. Personal displays of the Confederate flag are not affected. About 100 people led by the Sons of Confederate Veterans rallied before the vote and then showed up in force to speak to city council to dissuade them from enacting the ordinance. Other residents complained that the flag is a divisive symbol of the South's history of slavery and shouldn't be endorsed by the city. Afterward the group said they would legally challenge the ban in the city of 7,000. "I am a firm believer in the freedom to express our individual rights, which include flying the flag that we decide to fly," said Philip Way, a Civil War re-enactor who turned out for the late-summer rally clad in a Confederate wool uniform. "That's freedom to me." Mimi Knight, watching from a wrought iron fence at a sea of Confederate flags in a small city park, was not part of the rally. But she said she thought the city ordinance seemed too restrictive. "These are the things that make Lexington what it is," she said. "The Confederate flag is part of our heritage." Supporters of the ordinance were not apparent at the rally. Officials in this college town insist the limits are not aimed at the Confederate flag. "They can carry their flags anywhere they want," City Manager T. Jon Ellestad said. The city received hundreds of complaints the last time Confederate flags were planted in holders on lights poles in January to mark Lee-Jackson Day, a state holiday. People complained "that displaying the Confederate flag is very hurtful to groups of people," Ellestad said. "In their mind, it stands for the defense of slavery." The complaints convinced city leaders they should have clear guidelines governing the flying of flags and banners on light poles, Ellestad said. Heritage groups such as Sons of Confederate Veterans said the restrictions on the flying of the Confederate flag in Lexington are especially painful because of the two military leaders' strong ties here. A Virginia NAACP representative could not be immediately reached for comment. The NAACP launched an economic boycott of South Carolina in 1999 about the Confederate flag that flew atop the Statehouse dome and in the chambers of the House and Senate. A compromise in 2000 moved the flag to a monument outside the Statehouse. The group's president says the flag is a symbol of slavery and segregation. Jackson taught at Virginia Military Institute before the Civil War, where he became widely known as "Stonewall" after the first Battle of Manassas; he died in 1863 from wounds suffered at Chancellorsville along with pneumonia, and is buried in Lexington, according to the website for the Stonewall Jackson House. Lee, who led Confederate forces during the Civil War before finally surrendering at Appomattox in 1865, became president of what is now Washington and Lee University, where he is buried. "By all means they should be honored in their hometown," said Brandon Dorsey, commander of Camp 1296 of the Stonewall Brigade of the Confederate Veterans. "I look at the flag as honoring the veterans." This is not the first time Lexington, is at the southern end of the Shenandoah Valley, has clashed with the Sons of Confederate Veterans. The city attempted nearly 20 years ago to ban the display of the Confederate flag during a parade honoring Jackson. The American Civil Liberties Union, which successfully defended the group's bid to carry the flag, is closely watching this dispute from afar. "City council could live to regret this ordinance, as it imposes unusually restrictive limits on the use of the light poles," said Kent Willis, the ACLU's executive director in Virginia. "Sometime in the future when city officials want to use those light poles to promote a special event they may find themselves handcuffed by their own lawmaking." For the life of me.....I do not understand the whole flag thing. 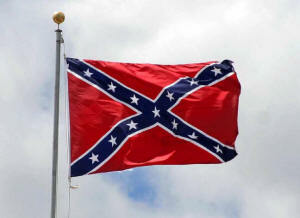 The Confederate States (South) wanted to secede from the Union (North) they went to war and Lost... get over it. By the way, how Patriotic was that!? Why is it necessary to carry the Flag of a loser? Can someone please, please, answer the question.